In keeping with the Dark theme, We will be spend the class looking at illegal and horrible martial arts techniques for use on the street either by themselves or to augment our Brazilian Jiu Jitsu such as eye gouges, nerve strikes, biting, neck cranks, pressure points and strikes from the ground. All excellent for self defence as well as techniques for low rules BJJ competition / MMA such as dangerous takedowns and leg locks. This will be followed by drinks out and a curry afterwards! £10 for the session or included in your membership if you pay monthly! Cant wait! See you there for No Holds Barred Self Defence in Portsmouth, Havant, Fareham Gosport, Chichester and Hampshire area! 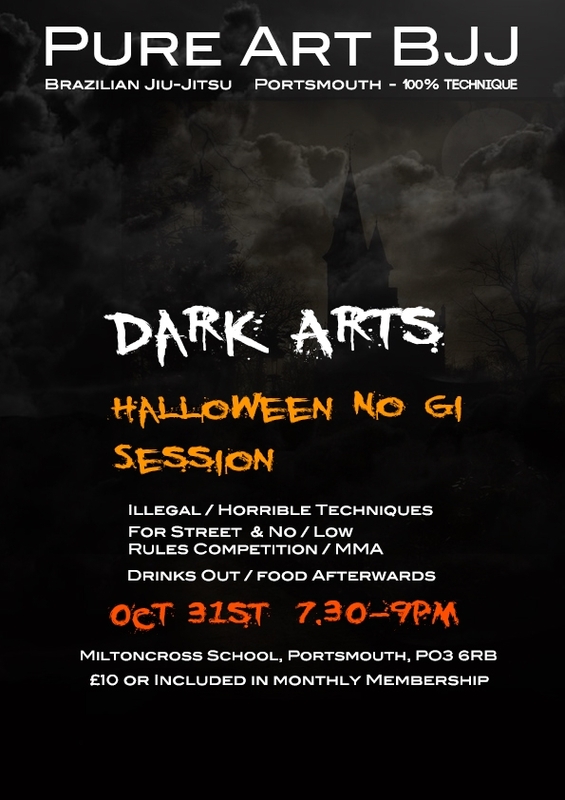 This entry was posted in Class Information, Seminars / Special Events and tagged Halloween, Illegal Techniques, Leg Locks, MMA, NHB, No GI, No Holds Barred, Portsmouth, Self Defence, Seminar, Social Event, Special Event by Adam Sparrow BJJ. Bookmark the permalink.